On Monday, Oct. 29, Attorney General Jeff Sessions spoke to a Boston chapter of the Federalist Society about his haunting vision for religious liberty. In an attempt to sell a story of Christian persecution and demonize the nonreligious, Sessions made several false or deeply misleading statements, including on the Freedom From Religion Foundation itself. FFRF offers the following rebuttal to Sessions’ most egregiously incorrect claims. First and foremost, Sessions repeated a Kellyanne Conway lie, stating that the recent synagogue shooting in Pittsburgh “was not just an attack on the Jewish faith. It was an attack on all people of faith. And it was an attack on America’s values of protecting those of faith.” The shooter was anti-Semitic, not anti-religious. He appears to be a Christian, quoting the New Testament to justify his anti-Semitism. Sessions and Conway are attempting to blame the crimes of their Christian nationalist supporters on the secular community, which is actually more committed to rooting out Christian nationalism (and by extension, white nationalism) than anyone else. Sessions’ speech also included misleading statements about the Declaration of Independence, the Religious Freedom Restoration Act (RFRA), and more. He even betrayed his own bible by proclaiming that “free exercise means a right to reasonably act, not just meditate in secret,” when the New Testament commands that “When you pray, do not be like the hypocrites, for they love to pray standing in the synagogues and on the street corners to be seen by others. . . . But when you pray, go into your room, close the door and prayer to your Father, who is unseen.” Matt. 6:5–6. 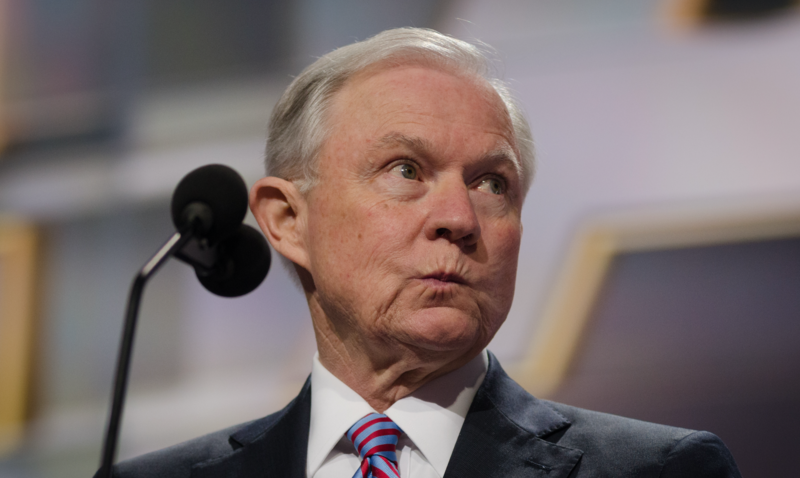 FFRF is committed to working to educate all Americans on the true meaning of religious liberty, as understood by the nation’s Founders, so that they can see speeches like Sessions’ for the bundle of lies and misstatements that they are. The Freedom From Religion Foundation is a national nonprofit organization with more than 32,000 members across the country, including in every state. FFRF’s purposes are to protect the constitutional principle of separation between church and state, and to educate the public on matters relating to nontheism.